The past decade has marked the rise of on-the-go hygiene products such as disposable wet wipes. The growing popularity of these products can be seen in the rising demand for affordable yet sustainable products that clean and provide comfort but don’t break the bank. With today’s hectic schedules and growing inclination for adventure and other recreational activities, people are seeking products that work well for both indoor and outdoor use. Surviveware recognized the growing need for wet wipes that work well for camping and personal use. This prompted the company to launch a new item in their product line: Surviveware Biodegradable Wet Wipes. This revolutionary product combines functionality and convenience into one versatile product. The biodegradable wet wipes are designed to be used for staying clean and fresh during intense and sweaty outdoor adventures. Made from durable cloth material, Surviveware’s Wet Wipes will not tear easily or leave lint on the skin. This feature gives its users a thorough wipe without having to step in the shower. Moreover, these wipes are bigger compared to regular baby wipes at 8” x 12”. With its size, it will only take one to two wipes to freshen an average-sized person. The product is hypoallergenic and moisture-enriched. Packed with natural aloe and vitamin E, these no-rinse wipes gently cleans and soothes the skin without irritating it. Its gentle formulation makes it ideal for cleaning sensitive areas and wiping babies’ skin. Also, it makes a great indoor cleaning item. It can be used to wipe leather covers, tables, and kitchen counters. Moreover, it won’t scratch surfaces or leave lint. Surviveware’s wet wipes dry nicely on the skin and don’t leave any sticky residue. This works well for hikers and campers who want to stay fresh despite long, dusty hikes. 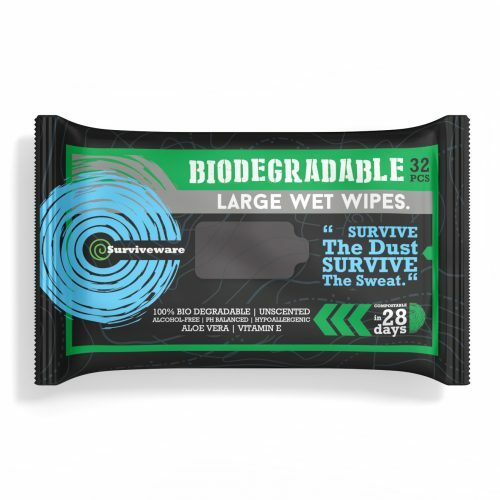 A premium grab-and-go-pack, each pack contains 32 scent-free wipes that disintegrate after 28 days. Therefore users don’t need to worry about contributing to the growing pile of garbage in landfills. Take this chance to enjoy shower-clean freshness minus the shower time. Order your very own Surviveware Biodegradable Wet Wipes today and enjoy the benefits of a hassle-free shower clean minus the shower time. Order your pack now by clicking here.